Currently, millions of Filipinos live without any kind of light source at all, but a band of resourceful MIT students have begun changing that. 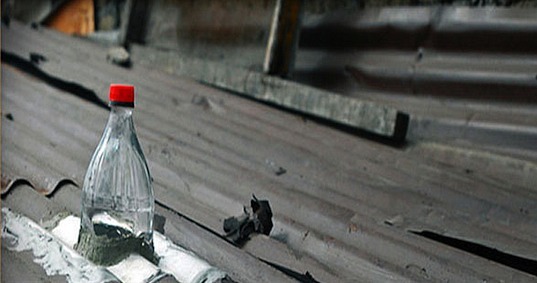 The students found that a one liter plastic bottle filled with bleach water and installed on top of a metal roof is a surprisingly simple way to light homes that have neither electrical connectivity nor natural lighting. The plastic defracts light and pushes it to every corner of a small slum house instead of beaming it onto one area like a typical lamp might. As part of their Solar Bottle Project, the organization Isang Litrong Liwanag, which means “A Liter of Light,” has already installed 10,000 of these ridiculously basic but amazing lamps throughout Manila. The roofs of many Manila shacks are painted black, preventing any kind of light from penetrating what are already depressing dwellings. The solution? Plastic bottles filled with bleach and water are inserted into a hole that is cut into the metal roof, and then sealed off; the bleach keeps the water both clear and free of potential germs. Although water is sometimes scarce in informal settlements, with just a liter, the equivalent of a standard 60 watt light bulb can be installed in less than a hour and works for as long as five years! It’s hard not to love a life-altering design that also happens to cost almost nothing. MIT student "installs" !!! first of all this eko-light is a concept know and not invented by anyone, it something that happens in places affected with war or poverty, not a project of "brilliant mind " from first world universities. You didn't invent anything, this is like claiming the invention of a wheel. I am sooo sick of this carp, pseudo -humanitarian- intelligent cr......p that you are passing as invention. This is not a solution for slams. This is just slapping a bit of make up on open wound. erm... why not replace a sheet of the roof with a transparent roof? Congratulation, smart-full and eco-friendly design which can be developed for modern building design in order to reduce electricity consumption.. I agree with Marcello, this invention has been around for over 6 years and originated in Brazil. It is a great idea and should be implemented everywhere, but give credit to where it is due. In fact using Marcello's link above perhaps it would be a good gesture for the people at MIT to presents the actual inventor with a donation or plaque of recognition. But for MIT (or the author) to claim inventor-ship when this has been around for 6 years, is just lame and bad PR for MIT. i think its amazing:)just interested to know how well it works at night time? Currently, millions of Filipinos live without any kind of light source at all, but a band of resourceful MIT students have begun changing that. 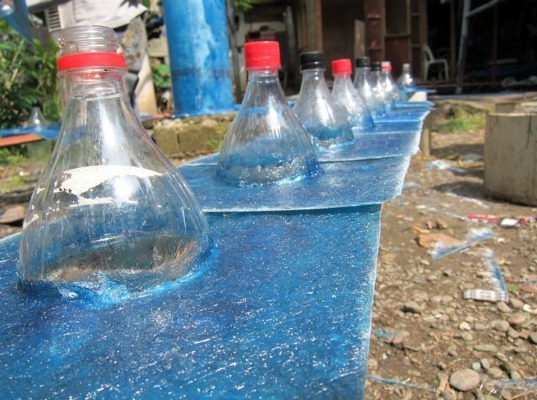 The students found that a one liter plastic bottle filled with bleach water and installed on top of a metal roof is a surprisingly simple way to light homes that have neither electrical connectivity nor natural lighting. The plastic defracts light and pushes it to every corner of a small slum house instead of beaming it onto one area like a typical lamp might. As part of their Solar Bottle Project, the organization Isang Litrong Liwanag, which means "A Liter of Light," has already installed 10,000 of these ridiculously basic but amazing lamps throughout Manila.